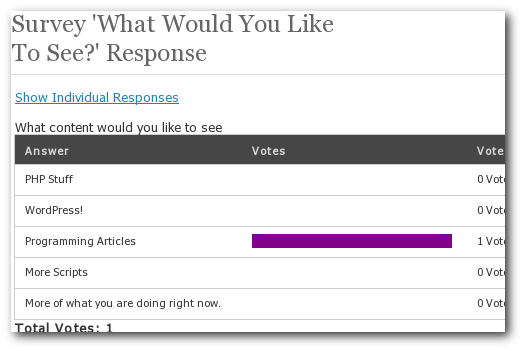 The Surveys WordPress plugin lets you add surveys to your blog. You can let the visitors take surveys and see the result from the admin side. The user who take the survey can enter their details at the end of the survey – or leave it as an anonymous result. 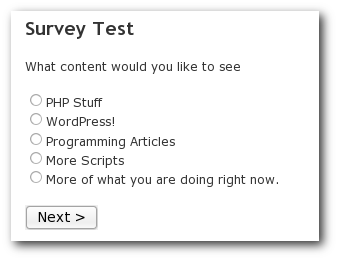 Note: Surveys is a beta plugin(as are most of the plugins released in the Plugin Week) – so watch out for bugs. And trust me, there will be a lot of them. First, Download, install and activate the Surveys plugin. Then go to Manage > Surveys section to create new surveys – or edit existing ones. After creating a survey insert the HTML comment [SURVEYS 1] into a post. Here, the 1 should be the ID of the survey you want to insert into that post. This will show the results each question by aggregating all the data so far. This will look like a poll result. This mode is useful to make decisions – you can immediately see the most favored answers for each question. You can also view all the answers provided by each visitor one by one. This mode has its uses as well. I have set up a demo for Surveys over at BinnyVA WordPress demo blog. Take a look. Next plugin – will be released tomorrow. A bit of feedback though – I’ve been working on customising the “Enter Contact Details” page and through testing, managed to accumulate a whole bunch of redundant responses. It’s good that I can delete the responses one by one in Manage Surveys (Show Individual Responses), but a “Delete All” button would have saved me so much time. It would be useful when you want to totally reset a survey too! Feel free to ignore 🙂 thanks for the hard work! Is there a way to translate this plugin? I’ve tried to edit the .po file in the lang folder using “PoEdit”; but no texts are changed. first of all many thxs for this plugin. Very usefull and working with Czech language. I´ve created first Survey and don´t know how to manage to display answers with checkboxes into a 2 colums. Anay idea? And the spaceing between the lines is too big, is it possible to make it smaller? I would be happy if someone will help me – I am not IT person at all and the survey is needed for thesis and still doesn? look like nice :-(. Many thanks. This was just what I was looking for. I can’t ger the shortcode to work though. Is there any other way to implement the survey into a page or post? Hello, where i can get the shorecode to install the survey in the page? Its there in the admin area. Hi there, can’t see how to export to CSV, can you assist? Plugin looks good, works fine. Also, a way to display all the surveys (as links?) would be nice. So I re-downloaded the previous version and it is working again. Any suggestions? Odd – it works correctly here. Which version of PHP are you using? Should be fixed now. New version released. I’m moving my site to a new wordpress installation and I want to export the current survey data I have. I found a way to export to csv, but I cannot see how to import this data back into the survey plugin installed in the new website. Is this possible? I also tried exporting the database info for the survey tables but could not get that to work either. Currently, exporting the database tables would be the best method. Why is it not working? Is it possible that only registered users can complete the survey? therefore eliminating the name, email etc.. part of the survey, and also helping identify the users of each survey? I am using survey to have a committee of 5 people assess applications for a number of different applicants. I would like to have one survey for each applicant to keep the information separate for each applicant. I was wandering if I would be able to duplicate a survey so that I do not need to recreate the questions multiple times. I am looking for a poll plugin that will able open ended questions also i.e. : thoughts and reactions on a certain discussion topic. Is that possible with this or does it need to have a multiple choice answer? We are trying to get info without influencing. from below the answers boxes. Nice, simple, elegant plug-in, but big problem: it permits same person to respond to same survey many times, leading to corrupt results. Is there any way to block repeat votes from same IP? Thanks! I don’t have that issue. Which version of plugin and WP are you using? I have one question with multiple answers so the NEXT button doesn’t work. My users don’t know that of course so I have to manually direct them to click SUBMIT and ignore NEXT. Any way to edit the code and lose the NEXT button? Just wanted to say thanks. Spent a few hours researching, tried a few others that were no good. This was simple to use and fits in perfectly with the design of my site. I had my test survey up in about 5 minutes (I stuffed around with the others for ages) and I only had 1 bug that was fixed in about 2 minutes with the help of your forum. Great plugin and great support forum, thanks very much! How can I edit the “Thank You” text and possibly add a checkbox for a newsletter opt-in? You’ll have to edit the code for that. What can I do to use the export function? If you have so much data, there will be a problem with export in a web server. My suggestion is to use the database browser to export the data. Perfect, just what I’ve been looking for. Thanks a lot Binny! Have you experienced any conflicts with fancybox and your plugin? I’m getting a few new fancybox-related errors, that are only appearing specific to the page the survey is on. Not positive your plugin is causing the conflict, just seems to be the common denominator. Otherwise, awesome plugin that has saved me a ton of time and grief! figured it out. you are loading jquery which was screwing up my load of jquery. you should think about adding a checkbox in the settings to enable/disable load of jQuery. really common problem amongst plugins. keep up the great work though, overall still a great plugin. Very usefully info!! I will be trying it soon, hopefully i don’t come across any issue. I looked at your quiz/survey, and not sure if it would support this type of “test”. Thanks! The survey plugin is working fantastically! I would like to add a captcha so that no bots are filling this out… Does that functionality exist? I think your plugin could be the right solution for me. I have just started to design my own surveys but before let people take these surveys I would like to kindly ask you some information. 1_Is there a maximum number of different surveys I can create in the admin dashboard? 2_Is there a maximum number of answers of different user I can collect? You plugin is just wonderfull. I translated the .po file in French. Everything works fine except the recieved email wich give funny characters with accents. In WordPress, all the accents are there and are good everywhere. I tried a brand new installation of the server: SME-8.0, WordPress-3.4.1, new Surveys and still the same problem. I am using Window$ XP. I tried with an OpenSuSE station. I’m looking into this. Will let you know. 1. how can i make some field “required”? You’ll have to edit the code of the plugin to do that. survey_form.php and survey_action.php should have that code. ok. what code needs to be modified? The example shown has only multiple choice questions…is it possible to have questions where personal answers can be written? Its possible – just click on the ‘Allow User Inputed Answers’ checkbox while adding the question. Just one question, I need to put a continue button with a custom link which will execute a script on the Thank You page, where can I find this page. It is possible to add multiple surveys in one page? Hi, is it possible to check user ip? if not, which files have I to modify in order to receive individual email results containing user ip? I LOVE THE SURVEY PLUGIN – I ATTEMPTED TO USE IT IN A WIDGET AND IT WILL NOT WORK – IS THERE A WAY TO USE IT WITHIN A WIDGET? > Delete all Responses does delete the Response but it DOES NOT delete the statistics. How do I delete the statistics? What’s the best way to show users the survey results? A lot of surveys let people see results on the front end after they submit. Reading the description, it looks like results are only visible on the admin back end. How can I edit the answers to be textarea every choice? You’ll have to edit the code for that. The ‘show_survey.php’ file to exact. Thanks for the plug in. Works great in WordPress 4.5.3 The only issue I have is that it wont send email. If you have any insight in to that I’d love to hear it. Outside of that, you’ve mad my daughter very happy as its her WordPress site that’s using it!